Your job is very important. Work can provide a sense of purpose, income to support yourself and possibly your family too. Your job also allows you to enjoy yourself with holidays and other pleasurable things that make up your life. We also know that work can be unpleasant, stressful and dangerous. Some of the typical things that employees and contractors experience and that WorkLawyers can help you with are described below. We are ready willing and able to help you avoid, solve and resolve problems at work so you can simply spend more time enjoying your life. Getting sacked is not pleasant. But we can help you protect your legal rights. Most Unfair Dismissal claims settle for significant financial compensation without going to Court. Some Unfair Dismissal claims result in people winning their jobs back. Strict time limits apply so call us on 0411263614 or 02 89642276 to ensure you are eligible to make a claim. Get the unfair dismissal app now! Have you been sacked, made redundant or told to “go quietly”? 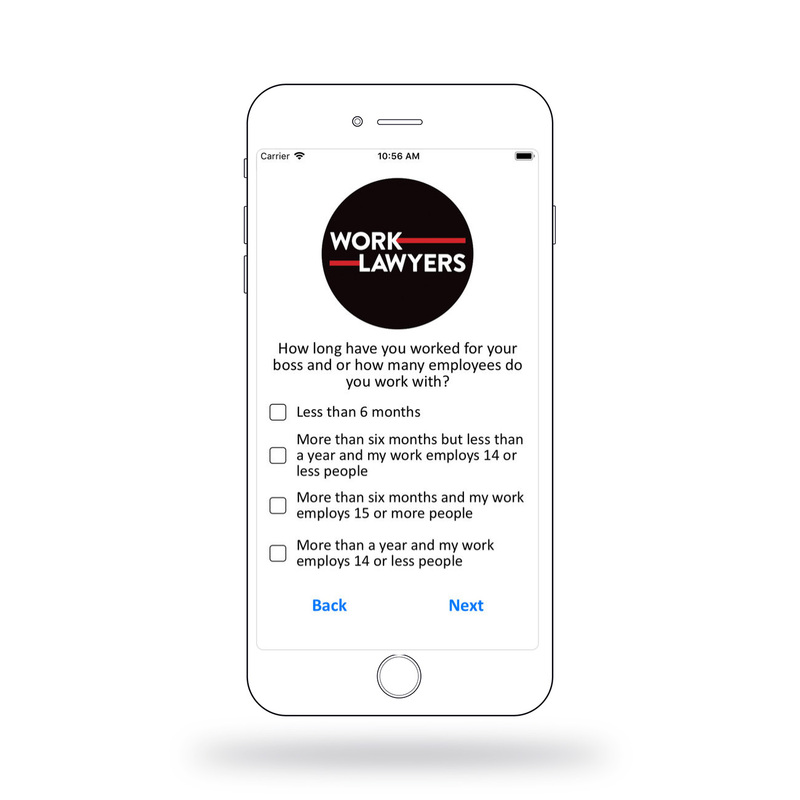 This free app helps you understand your rights to sue for unfair dismissal under Australia’s Fair Work Act. WorkLawyers’ Unfair Dismissal Assessor app is ground breaking legal software combining your circumstances to the main legal hurdles that employees have to overcome to have their unfair dismissal claim heard in Australia’s Fair Work Commission. 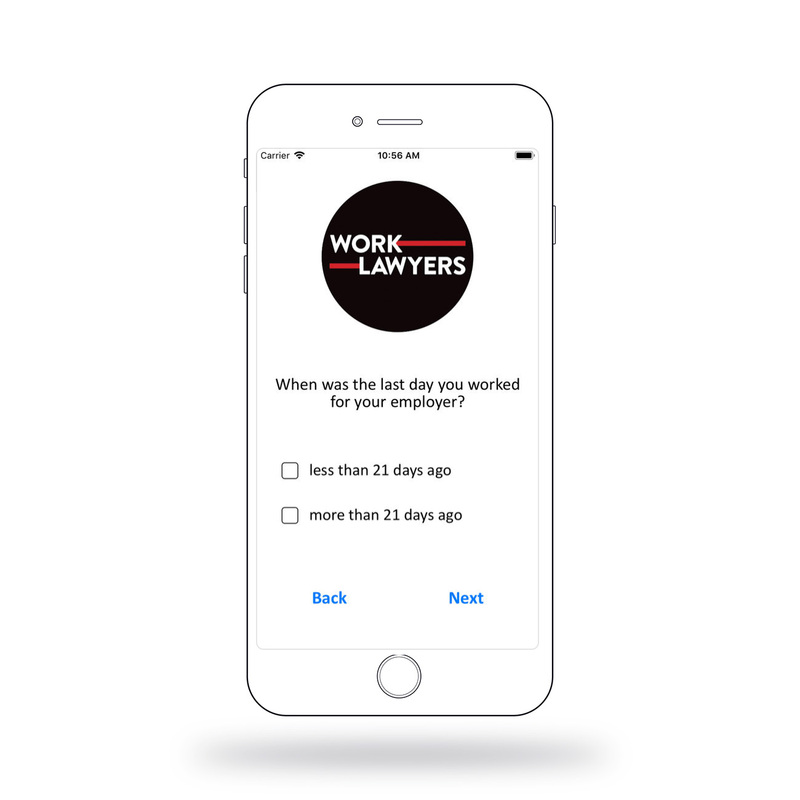 In just a few minutes this free app from Worklawyers will allow you to understand whether or not you are eligible to make a claim for Unfair Dismissal. This free app does this by setting out the jurisdictional barriers (were you dismissed? are you within time to make a claim? did you work past your probation period? are you under the high income threshold?) that if resolved in your favour show if you can make a valid claim for unfair dismissal. The app then gives you a summary of the information you can use later. It’s then up to you if you want to take it further. So no cold calls from lawyers. Guaranteed! And don’t worry, given the vast majority of claims for unfair dismissal settle, it is often the case that claims for unfair dismissal won’t require you to “go (or pay to go) to Court”. As part of WorkLawyers’ commitment to increasing access to justice, this app is free. Ratings and feedback on the app are encouraged and very welcome! Congratulations! You got the job. Now lets have a look at that contract your new boss has asked you to sign. With a fast turnaround (usually within 24 hours) we can advise you of the meaning of your contract and if you want, alternative words to protect your interests. We can also make polite representations on your behalf. Send us the contract to get started or Call us on 0411263614 or 02 89642276 first. Is something not quite right with your pay? If the numbers leave you feeling short changed we are happy to assist to confirm your rate of pay and if necessary take action to get it back. And often with interest. 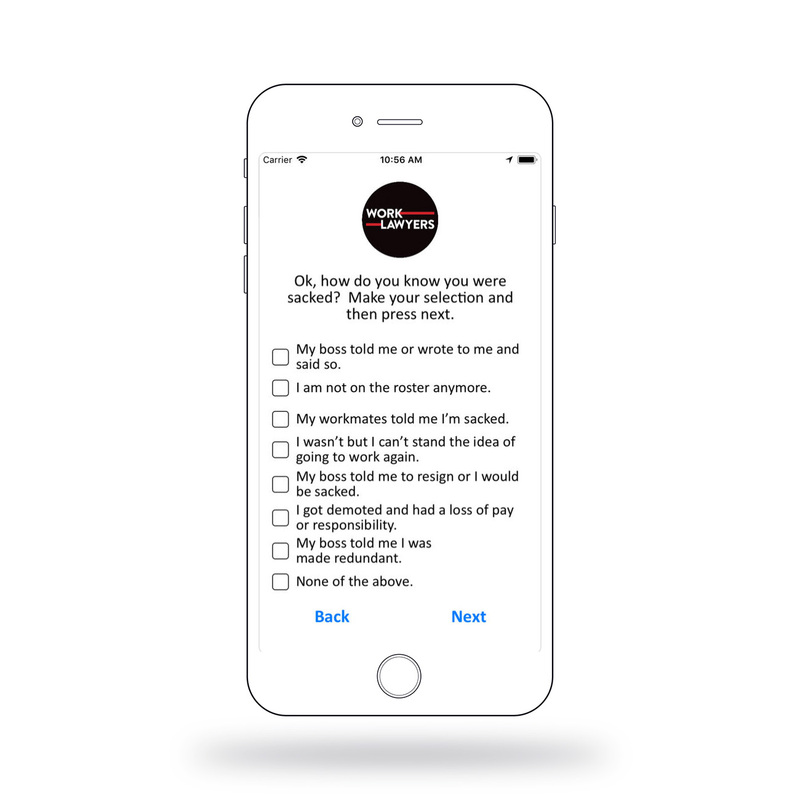 Call us on 0411263614 or 02 89642276 or email them through so we can review copies of your payslips and take action if required. If the boss calls you into the big office for a “discussion” about a recent event or issue, don’t hesitate to call us first. Don’t let an informal “chat” become the beginning of the end – of your job. We can offer you simple advice to keep the discussion smooth or if you need us to be very difficult that’s fine too. We are skilled at slowing things down so we’ve got time to guard your interests. Call us on 0411263614 or 02 89642276 or email today so we can discuss your upcoming meeting further. Is your colleague or boss behaving like a jerk? Well don’t cop it. We can assist you to resolve inappropriate, unhealthy and traumatic bullying at work. The new Stop Bullying powers provided to the Fair Work Commission can result in preventative Orders being issued against Bullies. Call us on 0411263614 or 02 89642276 for a sensitive discussion about this important new legal right. Is your boss treating you differently to other people? Are you being passed over for promotion or given the unpleasant jobs? Has your request for flexible working hours been rejected? You could be experiencing discrimination of a kind that is prohibited by Australian law. Call us on 0411263614 or 02 89642276 to discuss your circumstances and together we can make a plan to fix it. We’ve had considerable experience getting people their ASIC and MSIC cards back. Because we know that these cards are the key to your job we will take keeping them very seriously. Call us on 0411263614 or 02 89642276 or email us to work on getting you back in the gate and back on the roster. We can help you tie up loose ends so you can move on or if we can – help you stay right where you are. Sooner or later being made redundant happens to almost everyone. It can be a curse and a blessing. We can help you confirm your lawful entitlements to redundancy pay and notice and we can also contest if its genuine or not. Call us on 0411263614 or 02 89642276 or email us to work out your options. These are just some of the services that WorkLawyers offers. Contact us to start the process of fixing your issues at work. Fast response: We have a 100% success rate of responding on the same day. Frank advice: We’ll give it to you straight. No smoke and mirrors allowed. You’ll know where you stand when you talk to us. Fair (and clear) Prices. There is no charge for our first discussion and you control how much we do for you.